"How the brightness of stars can change based on distance, you'd think that with space being a giant vacuum, that the light wouldn't really dim." The stars we see might not be as bright/dim as they actually are." "In the textbook, it just said astronomers measure stars from two different viewpoints. I like how you specified that 'two different viewpoints for looking at a star is from Earth when it is at one end of its orbit, then six months later from Earth when it is at the other end of its orbit.' I thought that was helpful and interesting." "The video on how we study the stars based on light and wavelengths was cool." "The YouTube video on how we can determine the age, distance, and mass of a star by looking at its brightness." "White stars are hotter than red ones; because I thought red stars are the hottest." "That the hottest stars are white or blue, and the red stars are the coolest. You would think that red means hotter!" "How bigger stars aren't always the hottest and sometimes smaller ones can be hotter. 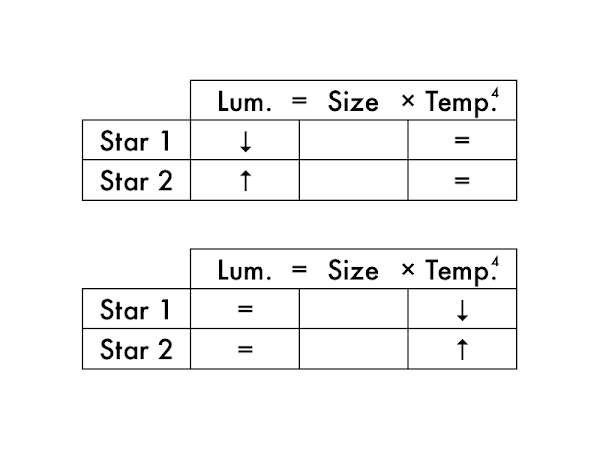 Also, how the color of the star shows the temperature of it (but still don't understand how)." "That a parsec is 3.26 light years. This was interesting because they say parsecs in movies and shows and I never really knew how much distance it was." "I found the arcseconds difficult, along with the earths parallax when figuring out how far away stars are. The fact that is slightly shifts means there further or closer confuses me, which is which." 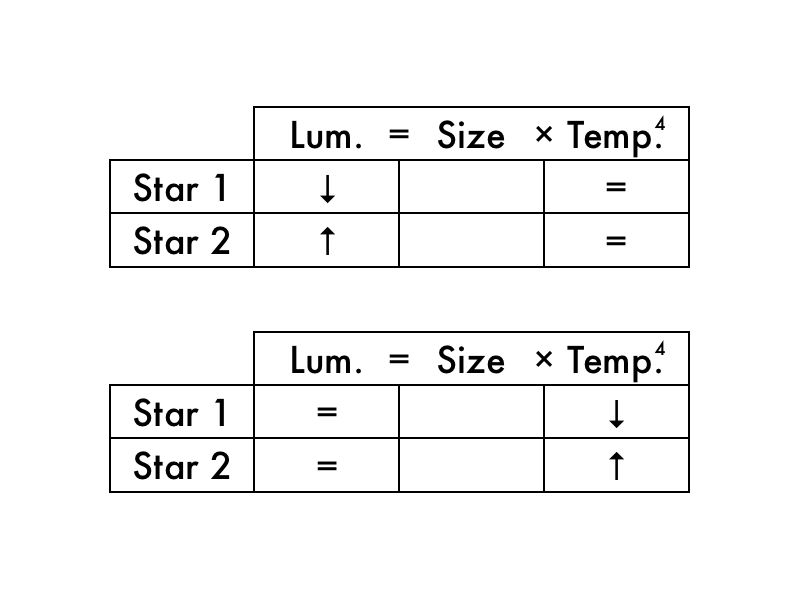 "Calculating the difference of luminosity using the absolute magnitude scale." "The brightness scale is confusing for me all around. I feel like I can remember it but I don't quite understand it." "Apparent and absolute magnitudes were really confusing and hard to understand because none of the questions were making sense on this assignment." "The spectra graphs were extremely confusing to look at and read, the descriptions underneath help with deciphering what is where but it is still confusing for me it seems busy and it makes my brain shut down." "I don't understand the luminosity = size × temperature formula or how to tell which star is larger when they are the same distance away. I need some more explanations and clarifications of this." "The Stefan-Boltzamann law was a little confusing to me and I could use a little more detailed and broken down explanation of it. Also, how we measure the distance of stars is a little confusing. Also, all this astronomy math going on? Helpppppppppp." "Wien's law and the Stefan-Boltzmann Law, and I also found how we determine the distances of the star to be confusing." "Teh only confusing law is 'since both stars have the same color [but one is bigger than the other], from Wien's law, they must have the same temperature.'" "Apparent magnitude is how bright we think a star is, and absolute magnitude is how bright the star actually is." "Absolute magnitude is the apparent visual magnitude that star would have if it were 10 pc away. Apparent magnitude is how stars look to human eyes observing from Earth." "Apparent magnitude measures how bright it is to you on earth while absolute magnitude is an idea that if you line up all the stars at the same distance away from you, you'd be able to tell which are the brightest." "Apparent magnitude is the brightness from Earth. Absolute magnitude is when you use the 'fair comparison distance' by putting both stars 10 parsecs away and then measuring the correct brightness." "This material has me nervous. I'm hoping lecture clears it up a bit." "Need to go over the two laws in more detail, Wien's law and the Stefan-Boltzmann law." "Can we go over the temperature of the stars a little more?" "Can we go over the luminosity-size-temperature charts?"